I've just finished Callum Roberts' 2012 book The Ocean of Life and it has me thinking about how useful historical data can be to modern debates about ecology and climate change. My husband bought me the book to read during my plane ride to Manchester, UK to attend the International Congress for the History of Science, Technology and Medicine (ICHSTM) last month and it, combined with a talk I saw while at the conference (which I will discuss later), lead to this blog post. It seems simple to say that humans have a hard time believing things we can't see with our own eyes. I've talked a lot on this blog about the difficulty of reintroducing "native" species because the people who have to deal with the reintroduction don't imagine them as "natural" to that landscape- they've never co-existed with them in the past. But it is something else to say scientists have a hard time dealing with these historical issues. It makes sense- scientists are totally humans. But what does it mean to deal with an "intergenerational shift in the way we perceive the world" in science? Roberts suggests that this limited ability to visualize the past landscape leads ecologists and environmentalists to underestimate the amount of change in an ecosystem over time. If you can't even imagine what it used to be like, or that it was different, how can you predict the changes that might occur? One way to do this is to use historical archives to establish baselines so that we can see the change. Roberts points to two bodies of work, that of Loren McClenachan (a professor at Cobly College in Maine) and Ruth Thurstan (one of his graduate students at York). Both of these scientists use different forms of archival data to establish change over time in a given ecosystem. McClenachan utilizes a variety of archival sources, including historical photographs of game fishing in the Florida Keys, to ascertain the downward shift in size of game fishes caught in the Florida Keys from the 50s to the present. Thurstan utilized previously forgotten government fishing data from the 1880s to the present to analyze the decline in catches. From "The effects of 118 years of industrial fishing on on UK bottom trawl fisheries" by Thurstan, Simon Brockington, and Collum Roberts in Nature Communications 1:15 (May 2010). Both of these papers are exceedingly interesting for what they tell us about the overall decline of fish stocks, but they are also examples of how scientists have extracted useful information from data gathered for a completely different purpose. The photos of game fishes were not taken to later be used for scientific purposes, and a scientists could not necessarily use just any picture as scientific data. McClenachan used photos taken on two separate boats by the same professional photographer, and each photo displayed the largest catches each day. In essence, the author had to make sure that the photographs represented something important, and that they were taken in a consistent manner. Thurstan ran into a different problem: fishing technology has changed greatly since the 1880s. So, how do you compare information gathered in the late 19th century with information gathered today? Thurstan looks at different "units of fishing power" and measures the size of stocks based on "landings per unit of fishing power". Both scientists found useful data, but not in ready use form (or the form that many scientists are used to working with); the historical information wasn't necessarily ready-use, but it was useful. This brings me to the paper I saw in Manchester. While I was at the conference, I was lucky enough to catch Marcel Wernand speaking about his recent paper with Hedrick van der Woerd and Winfried Gieskes entitled "Trends in Ocean Colour and Chlorophyll Concentration from 1889 to 2000, Worldwide" published in June 2013. Wernand and his colleagues start with the understanding that ocean color correlates to specific conditions, i.e. 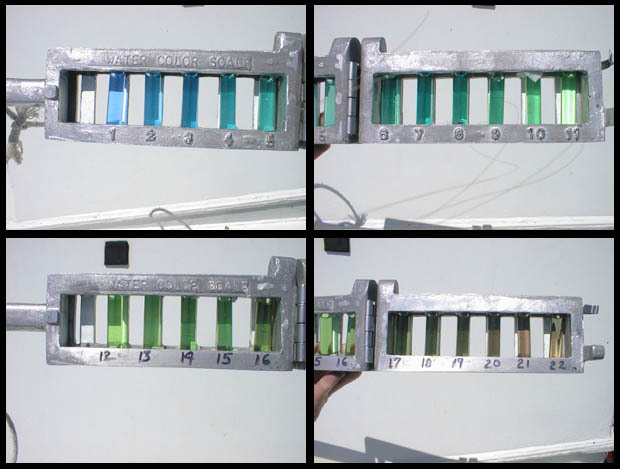 a green color corresponds to a higher content of chlorophyll blooms. Most recently, scientists have used data about ocean color collected from satellites, but Wernand et al wanted to look at a longer data set to ascertain plankton bloom changes over a greater period of time. But, how to access data about ocean color before satellites existed? The authors turned to something called the Forel-Ule scale. This tool has been included on board ships from the 1880s onward, and is fairly simple to operate. Above, you see there are 21 different colors of water in the tool. Anyone on a ship- from the naturalist to the captain to a sailor- could enter Forel-Ule data each day during a sea voyage. And, it turns out, they did. The authors used digitized oceanographic and meteorological databases archived by NOAA-NODC totally 220,440 FU observations between 1907 and 1999. Before 1907, they turned to other historical information from major voyages and came up with 221,110 FU observations with which to work. Unlike recent papers that suggest that plankton blooms have decreased worldwide recently, using these data sets Wernand et al found that plankton blooms have shifted throughout the world's oceans since 1889, but they have not experienced a blanket decline. All three of these papers utilized a different form of historical data to assess the current status of the world's oceans, and archival data continues to be useful. NOAA has three ongoing historical ecology projects looking at the history of Stelweggen Banks and cod fisheries in Massachusetts, the Florida Keys coral reef project, and the Monterey Bay National Marine Sanctuary project. Theses projects pair historians and scientists together to sift through archival data and examine the relevance of that data to modern understandings of ongoing ocean change. Pretty cool. When I'm in the archives, I consistently run into large data sets- something that isn't necessarily helpful to me but could be helpful to scientists interested in catches and data from a particular area. In the Smithsonian archives, there are log books that contain hourly information on tides, ocean color, temperature, location, and fish catches. All are meticulously kept and just waiting for someone to take a look. And even though I get bummed that what I thought might be a useful journal (for me) turns out to be thousands and thousands of tiny entries about water temperature and color, in the long run, it's great to know that that data can be mined for useful information. And, it makes it all the more important that we recognize that archives and historical data are not useless- they need to be preserved not only for historians but for the establishment of baseline ecological and environmental data. Callum Roberts laments society's short memories of our surroundings- He suggests we scoff at the musings of our parents and grandparents when they states that our environment has changed over time; we understand only our limited personal experiences. But, this doesn't mean we can't access and quantify those memories at which we sometimes scoff. Historical ecologists and climatologists working with archival data have found multiple ways to access and quantify these memories, including photographs, statistics, and consistent tool use over time. Described as being "to identify, recover, and (when necessary) digitize historic oceanographic observation data." I don't think there are any historians involved. There are quite a few NOAA projects that say that they combine the expertise of historians and scientists to sort through data, but I couldn't find out how to get involved as a historians, or if there were any historians actually actively involved! I also found it very interesting that the Key West project is located at Scripps instead of somewhere in Florida. I thought it would be great to figure out how, as historians who run into a lot of this data, we could get involved with these projects and figure out how to build more concrete bridges between historians of science and scientists working with historical documentation.